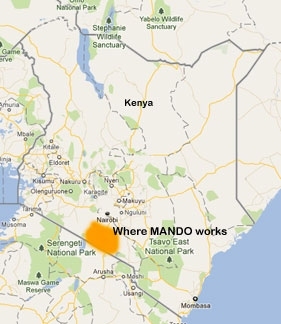 MANDO is a young, rapidly growing non-profit NGO addressing huge challenges in the southern Rift Valley of Kenya. Its nomadic, pastoral Maasai people face such a severe drought that they are forced to become more agriculturally based. This means reliable water sources must be close to evolving communities. MANDO is looking to help with this adjustment and at the same time overcome root causes of poverty, introduce sustainable methods of subsistence, improve education and gender equality. MANDO’s highly effective approach is based on encouraging and enabling the people in planning and decision making. Its Board is comprised of community members who volunteer time and effort. They pledge to maintain openness and accountability to constituents and partners. MANDO’s mission is to support education, focusing main efforts on Maasai communities: Eremit, Esonorua, Emboliei, Oltepesi, Enkereyian, Inyonyori, Kisames and Mosiro. MANDO works with local leaders and elders to improve water supplies, schools, health centres and women’s and girls’ status. MANDO is committed to ensuring that Maasai communities have access to high quality education, clean water and primary health care to successfully achieve their goals and potential. MANDO tackles the root causes of poverty and inequality with the goal of creating a new economically empowered, ethical generation. MANDO’s Board of Trustees decides strategic direction, delivers on objectives and ensures the organisation is solvent, well-run and upholds its values. Since its inception in 2007 MANDO adheres to well-defined organisational rules. The Board is comprised of not less than three nor more than seven persons elected at the Annual General Meeting. Leadership is by those involved. Grassroots mobilisation is the key. Systems are in place for reporting, monitoring, and maintaining an ethical framework for all those who work on behalf of the organisation – subcommittees, standing groups such as the Financial Management Group and other delegated advisory panels.